SciPackDigital resources are stored online in your NSTA Library. The Rock SciPack explores different kinds and categories of rocks, the major processes through which they form and the cyclical nature of the formation and transformation of rock materials. The focus is on topics supporting Standards and Benchmarks related to the rock cycle as part of the transfer and transformation of matter and energy in Earth’s system as well as a sense of the time scales involved and how rocks provide information about their own development and the history of Earth. I recommend this SciPack to any teacher that is or will be in the science setting. I learned so much content that I can take into the classroom with me. I remembered some about the rock and rock cycle, but this refresher course was so helpful! I will be looking into more SciPacks, as they are easy to navigate and peruse. I found this SciPack enjoyable! I found it interesting how old rocks are! It was interesting to learn about the rock cycle, because it has been so long since I had reviewed it. Overall, this was a good SciPack for rock lovers! I would definitely recommend this to others. The sci-pack was very informative. I knew the basic concepts of the rock cycle, but this went much further in depth. There were also great interactives throughout the sci-pack that kept me engaged. I actually enjoyed what I was learning. This SciPack was very interesting. I have previous knowledge of rocks but to review it was very helpful. This SciPack had great pictures and examples to go along with it. There were also great interactive aspects of it. I would definitely use it if I were to teach a high school level class. It was very intriguing and it was awesome to learn about things I did not know about rocks. The "Rocks" SciPack was extremely helpful. I have to take a geology course this summer, so I chose the "Rocks" pack to help prepare me. I truly feel that I will be able to ace my geology course because of this SciPack. I learned about the types of rock, the rock cycle, how rocks are formed, and tons more vital information. I love that it covers benchmarks, standards, and implications at the end. This is very helpful for teachers looking to use this information in the classroom, in any grade as well! The SciPack gives you plenty of opportunities to review what you have learned so that you can assess your progress and decide whether or not it is time to move on. I really enjoyed this SciPack. I think that it had great information, and really enhanced my understanding of the rock cycle. This would be awesome professional development for any teacher who is preparing to teach about sedimentary, igneous, and metamorphic rocks. I found this SciPack to be an excellent resource with in-depth descriptions of rocks. 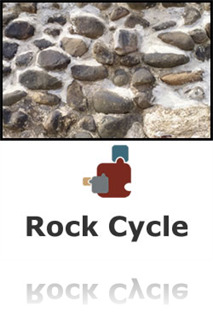 Some of the main topics include: the different types of rocks, the process of the rock cycle, how and where rocks are formed, how rocks can be used to determine age, the transfer of matter and energy, and much more. I felt that the short quizzes spaced throughout the unit were reflective of the material covered, reinforced the essential concepts, and prepared me for the cumulative assessment at the end of the course. One of my favorite aspects of this SciPack was the interactive pictures and virtual manipulatives that demonstrated the material in a visual manner. I really valued the connection made at the end of the SciPack from the content covered to standards and benchmarks that teachers are expected to cover in the classroom; I felt that this helped me to see the progression of material throughout the grades. The "Rocks" SciPack was extremely informational and gave me more of an in-depth understanding of the different rock types Earth is made up of. The SciPack went into great detail about the rock cycle and presented the information in an organized way. This was a great refresher for my future in teaching. This SciPack is very informative and had was packed with details about rocks. I learned alot about the rock cycle that I had no clue about before doing this SciPack. I really liked how there were quizzes after the sections to test what you had already gone over it, it was very helpful! I really enjoyed this SciPack! I liked how it provides questions to make sure you are learning the information because it makes sure you grasp the idea before moving on to the next portion. I also like that is had interactive sections that provided deeper understanding on certain concepts throughout the SciPack. I really liked the way it presented the information and even had the option to have it read to you and follow along, it has a lot of different methods to receive the information. This SciPack was very informative and I like how it keeps track of what you do. I also like how it has quiz questions after every section. This was a very informative SciPak about the rock cycle and how different types of rocks are formed. It was presented in a manner that did not lose you in the details. This was a great Scipack. I loved all the visuals that helped explain the concepts. The assessment was better than some of the other Scipacks that I have completed because it was material that was covered multiple times in the course. The material kept me engaged the whole time because it was very interesting. However, I went through the material once and then when I went to take the assessment it said that I had not completed any of the Scipack. I had to go back through and click on each section for it to allow me to take the assessment. Other than that, great Scipack. This SciPack was very informational and I thoroughly enjoyed it. I would highly recommend it. Especially if you need a refresher about Rocks and the Rock Cycle. I thought this scipak was very beneficial in refreshing my knowledge about rocks and how to present information about rocks to my students! As I was doing this scipak, I was thinking of different experiments and observations that my students could take part in with this content. I think this scipack was very helpful when learning information about rocks. I feel as if it taught many lots of information about rocks that I now feel confident enough to teach the topic to my students. I liked how it broke down the topic but then connecting all aspects of the topic back together at the end. The scipack on rocks was AWESOME. I thought that the scipack presented the information in a way that made it very easy for me to absorb and understand it. I chose to do this scipack because I have a love for rocks and rocks can be used to hit a lot of different standards in many grades. Rocks are talked about a lot in 3rd grade, but you can also use rocks to separate living from nonliving things. I recommend this scipack for any elementary teacher. This Scipack is a great way to learn about or to refresh on rocks before teaching them to the students. The Scipack is very easy to follow. It would be a great course to take to farther your learning. I really enjoy the SciPack format for learning. I can go back and review material if I did not fully understand the concept. This particular SciPack gives the teacher a much better understanding of rocks and the processes used to change them from one type to another. A worth while activity for those who teach Earth Science. I was impressed with this sci-pack and the use of many analogies I could use in the classroom to help my students understand hard to visualize concepts in Geology! Well Done! The structure of the SciPacks really help me understand the underlying concepts that surround each topic. I had a lot of fear of science before learning about the NSTA Learning Center, and Initially, I was unsure of how well I'd grasp scientific concepts in a self-paced, online format. However, the carefully sequenced topics, interactive activities and simulations, in addition to the voice-over explanations work well together to help deepen my understanding in the content area. Especially valuable are the pedagogical implications and common student misconceptions. I feel a lot more knowledgeable about a subject after using a SciPack, and I highly recommend the Rocks SciPack to anyone needing to learn more about this topic or review key concepts. I really liked this SciPack. The information was excellent and entertaining at the same time and the assessment was straightforward, aligned with the text and study questions and had no trick questions. Rocks was well written! It starts off slow and works its way up to complex geological theories. They use comparisons to to other things that helps make sense of what is being described. The message was simple and easy to grasp. The questions were relevant to what was being taught and reflected what was being learned. The most interesting thing is that I thought rocks had nothing to do with me and started rocks with no real interest. However, as I read through I found that rocks has everything to do with me and the formation of the environment around me. I did not realize it initially, but I have rocks all over my house, even on my desk at school. Overall, a great resource, I would highly recommend rocks especially if you have little to no geological content experiences. Very good information on rocks. I will definitely use it in my classroom. This was a great SciPack for me. I knew very little about geology and the fundamental concepts that define the field. I was worried before I took this SciPack that I would be expected to learn all sorts of classifications and rock names, but none of that is expected of you. Instead, there is a focus on fundamentals, such as how rocks are formed, how you can tell what environment a rock is formed in, and information as to how to classify rocks. Armed with the information of how geologists make their classifications, I feel that I could possibly learn now the names of a variety of different rocks and have it mean something. There are a few typos to work out in the system. In some of the questions, there was a repeat of a multiple choice option. Also, I think there was a mistake in a questions where you compare the glass cycle to the rock cycle--two of the pictures were identical. Finally, and this is a comment on ALL SciPacks I have done, it would be nice if they had more "radio buttons" on the categorize style questions. It's not the end of the world to uncheck a box if you change your mind, but why make it so that you ever have to? I don't want to end on a negative note, so I'll say that I enjoyed this SciPack far more than I thought I would. Awesome SciPack. This experience takes you on a journey of the processes of the rock cycle, and clearly and concisely explains the differences among igneous, metamorphic, and sedimentary rock. It was very engaging and many of the resources can be used with scholars. This SciPack offers educators an in-depth review/introduction to the rock we call Earth! Clarity, completeness and continuity are the keynotes in formulating the concepts in this PD! Thanks again, NSTA! I really enjoyed completing this SciPack. It gave me a lot of background information that I can use to answer student questions that come up during our rock unit. I found the info on the age of rocks and Earth very interesting. I also enjoyed the analogy between the rock cycle and recycling. What a thoroughly enjoyable SciPack experience! The content was perfect for deepening my understanding and is a great precursor to Earth’s Changing Surface SciPack. I was completely fascinated by the Earth Mars Comparisons and plan to share these with my students. I really enjoyed doing this Scipack. It did take a lot of time, however it did not feel that long because of all the cool information and fun interactive tasks. I loved the interactive videos. One problem i had was that i did not know that i needed the player downloaded in order to do the interactive videos. So i had to exit out and download it just to do it. Other than that I had no problem. Very helpful and I learned a lot! This SciPack was packed with interesting information! I really liked learning more in depth about the rocks under my feet. The questions throughout the packet really prepared me for the assessment at the end, however, I gave it a 4 because I felt that at times the packet was too lengthy and tend to repeat itself. Besides that, I really enjoyed this learning experience! Material is presented in a clear and easy to follow manner. I did come away with ideas on how I can change up my lessons to get students thinking more. The comparisons to Mars were interesting. This SciPack was very helpful in demonstrating not only the different types of rocks found on our planet, but their origin and composition. The information in this resource ranged from review (there are 3 main types of rocks) to advanced (the crust is primarily granodiorite, the mantle is primarily peridotite). There are also a number of excellent activities presented in this SciPack that can be used in the classroom to illustrate many concepts. This SciPack described the process of rock cycling with a focus on the rock categories, formation and the geologic record that can be extracted from rocks through observation. One Science Object is devoted to each of the following areas: Categories by Process, Environments of Formation, Cycling, and Earth’s Autobiography. I am math certified and trying to get science certified, so I found many things that I had forgotten or never become fluent with. The content that had the biggest impact for me was the material in the Science Objects “Environments of Formation” and “Cycling” which describes the processes by which rocks form, transform and break down. It kind of reminded me of the water cycle. Even though the processes are very different, I could take the water cycle which I do understand and put my new learning on a similar hook in my mind so that I retain more of the new knowledge, and I needed the hook. Not as bad as paint drying. I want to help my students build a frame work for storing new knowledge that connects to things they already are familiar with. Since this content targets rocks and we live on a rock making factory (Big Island of Hawaii), I would like to tap into local resources for examples and for things in their environment with which they are already familiar.